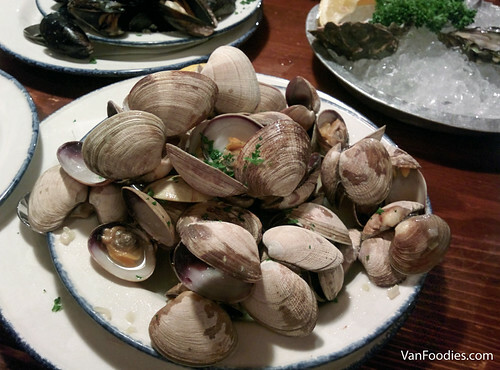 Next, there was an abundance of Steamed Clams! The broth was quite tasty, you can taste the saltiness from the sea plus the richness from the butter. But the meat texture was a bit chewy, so it was a bit disappointing. 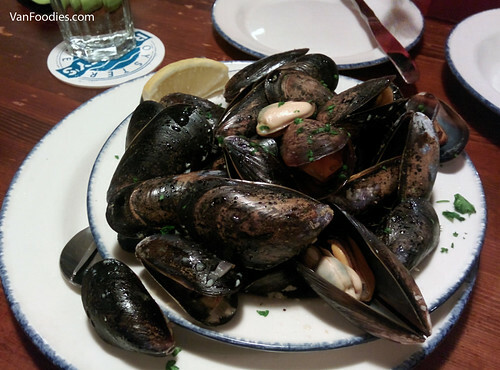 Similar to the clams, there were a lot of Steamed Mussels to go around! The mussels were not all that big, but still plump and tasted fresh. The broth here was also quite similar to the clam one, except it had a bit of acidity from the use of wine. 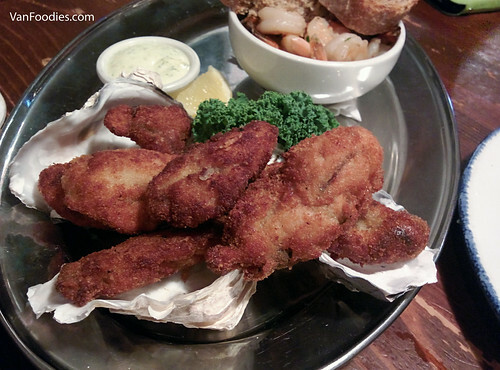 LW doesn’t eat raw oysters, so we ordered some Pan Fried Oysters. These oysters were much bigger than the raw oysters, more meaty and juicy. 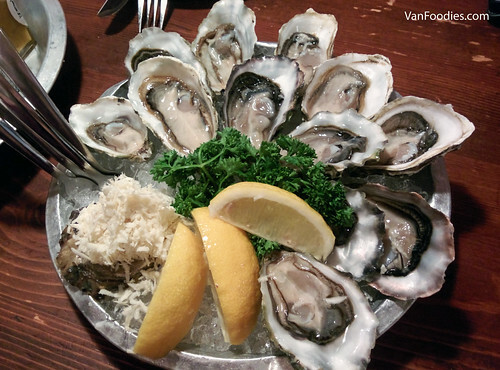 They were just lightly breaded, allowing you to savour the fresh oyster flavours. With a splash of lemon and a thin smear of the tartar sauce, this was quite enjoyable. 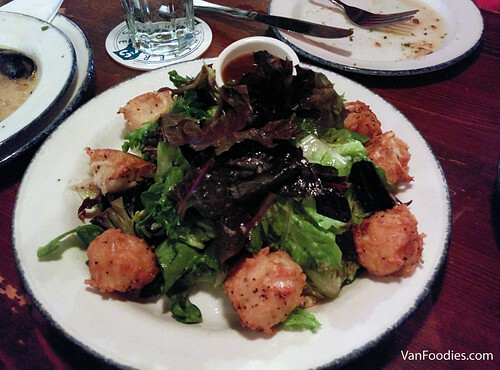 The Garlic Shrimp had a really nice crunchy texture. It’s slightly garlicky but it’s quite similar to the clam and mussel broth, and I didn’t really taste the heat from the chili peppers. 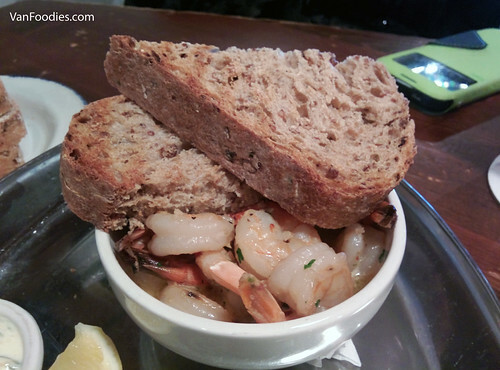 The bread provided was great for dipping into this broth and other broths on the table. Simple dish yet quite well executed. And finally some greens from the Scallop Galette! I was quite happy with how the scallops were seared. With the potato crush, they were extra crunchy and crispy. There was a decent amount of scallops to share, although I wish they were slightly bigger (yes, I’m quite greedy!). Rodney’s doesn’t take reservations. When we arrived at 5pm, there was a lineup, but for smaller tables. While it took us no time to be seated, we needed to clear the table by 7pm. That being said, the service wasn’t rushed. The restaurant was busy, but the food service was still relatively prompt and servers were quite nice. We would’ve liked to stick around and continue with ordering more from the dinner menu, but we ran out of time, so that would have to wait for next visit. 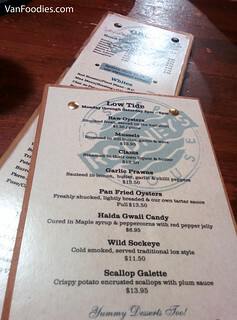 The Happy Hour (“Low Tide”) menu at Rodney’s offers a good selection of simple, hearty seafood dishes. They aren’t overly discounted, but quite affordable considering it’s located in Yaletown. 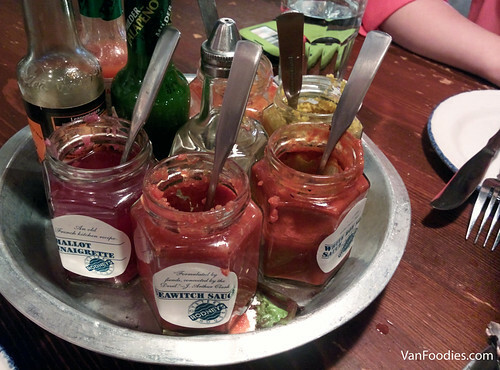 These dishes are of decent portion and great for sharing. I would come back again for Happy Hour. Maybe next time at the Gastown location.